To some Western observers in Baghdad, it seemed like an odd thing for al-Maliki to mention, given the more momentous theme of the day. The MEK is an obscure group known for launching attacks on Iran in the 1980s and '90s, when Iraq and Iran were bitter, warring enemies. But since the 2003 invasion of Iraq, the MEK has been stripped of its weapons, confined to its base at Camp Ashraf about 80 miles north of Baghdad and guarded by U.S. troops. The group is hardly an immediate threat to Iraqi security, or even particularly relevant to the challenges Iraq faces under the new U.S.-Iraq security pact. But when the U.S. military formally transferred control of Camp Ashraf back to the Iraqi government on Jan. 1, the MEK's fate suddenly became an issue. The group is a source of contention for Iran and the U.S., Iraq's two biggest allies, who are increasingly vying for influence as Baghdad's postSaddam Hussein Shi'ite government asserts its independence. All three countries label the MEK a terrorist organization. Iran wants the group handed over for prosecution. But the U.S. has pledged to ensure the group's rights under international law. The question now isn't just what to do with the 3,500 Iranians at Camp Ashraf  it's also who decides their future. Past U.S. ties to the group suggest that the Geneva Convention isn't the only reason Washington might not want to throw the MEK to the wolves just yet. But how deeply is Washington invested? The answer may lie in how Baghdad chooses to deal with the group. Founded in Iran in the 1960s on an ideological platform merging Marxism and Islamism, the MEK worked alongside followers of Ayatullah Ruhollah Khomeini to overthrow the shah in the 1979 Islamic revolution, and assisted in the ensuing U.S. embassy hostage crisis. But they clashed with Khomeini in the years that followed, leading to the killing, imprisonment and exile of thousands of the group's members. In 1986 the MEK set up a base at Camp Ashraf, located in Iraq's eastern Diyala province, and began receiving funding and protection from Saddam to launch attacks over the border into Iran. Despite its position on the U.S. terrorist list since 1997, and reports by former members of abusive and cultlike practices at Ashraf, the MEK has gathered support from some surprising places abroad  especially since the U.S. invasion  by pitching itself as a viable opposition to the mullahs in Tehran. "They have been extremely clever and very, very effective in their propaganda and lobbying of members of Congress," says Gary Sick, a Persian Gulf expert at Columbia University's Middle East Institute and the author of All Fall Down: America's Tragic Encounter With Iran. "They get all sorts of people to sign their petitions. Many times the Congressmen don't know what they're signing." But others, Sick adds, "are quite aware of the fact that this is a designated terrorist organization, and they are quite willing to look the other way for a group that they think is a democratic alternative to the Iranian regime." The group's Paris-based umbrella organization, the National Council of Resistance of Iran, has held fundraisers in Washington. One of the group's former spokesmen, Alireza Jafarzadeh, now serves as a Fox News foreign affairs analyst. From Paris, the group's leader, Maryam Rajavi, has waged an effective p.r. campaign, gathering a following of European MPs to support removal of the group from the E.U. 's terrorist list and to oppose Ashraf's closure. Even some Iraqis see value in keeping the camp intact. "We have many differences with Iran, and Iran is very deeply involved in Iraq, so I don't think it's wise to end the Iranian resistance," said Salah al-Mutlaq, a Sunni member of parliament from the Iraqi National Dialogue Front. "For the Americans, surrendering the Mujahedin-e Khalq file to the Iraqi government is a big mistake." For the most part, however, the MEK is no more popular with the Iraqi population than it is with the central government. In his speech from the Green Zone on New Year's Day, al-Maliki made it clear that the MEK would lose its protected status. "This group has been labeled a terrorist organization," al-Maliki said. "It can no longer operate in Iraq after today because it has caused a political crisis that contradicts the constitution ... We will never force any of these people to go back to their country ... but Iraq cannot be a base for these people." The move to oust the MEK was anticipated, but the promise not to deport them to Iran was a welcome relief for the group's supporters and human rights organizations. For months, the National Council of Resistance of Iran has led demonstrations in New York, Paris, Geneva and Washington to protest the possible transfer of Camp Ashraf's residents to Iran. Al-Maliki's decision not to hand them over may indicate a small U.S. victory. While the U.S. government has remained relatively quiet on the Ashraf issue lately, Washington's approach isn't entirely passive. In a Jan. 1 press release, the U.S. embassy in Baghdad said an unspecified number of U.S. troops have remained at the camp since the formal handover of control to Iraq. "U.S. forces will maintain a presence at Camp Ashraf and will continue to assist the government of Iraq in carrying out its assurances of humane treatment of the residents of Camp Ashraf," the release stated. The Iraqi government provided written assurances that the group would be treated in accordance with Iraqi law, and the U.S. government would remain involved in resolving the group's future, according to the release. U.S. embassy officials declined to comment on what that future might look like. Just two days after making his declaration to the MEK, al-Maliki left for a scheduled diplomatic visit to Iran  his fourth since taking office. The Iraqi Prime Minister was expected to try to ease fears that Iraq might be used as a base to attack Iran. He has pledged that won't happen. 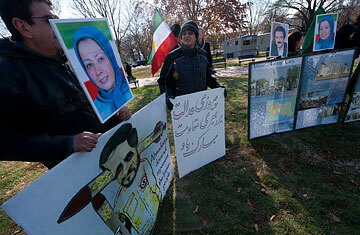 But it remains uncertain as to what is in store for the MEK. See pictures of U.S. troops in Iraq.